My Journey to Fit: "You Can't Eat That"
"You can't eat that" - I was told that not once but twice at a dessert and coffee fundraiser that we went to a week ago. Boy did this bring back memories...I was transported back to the summer of 1980, standing at a Togo's sandwich shop in Santa Cruz, California. I was there with my boyfriend, Jon, and a bunch of my friends - we routinely drove "over the hill" from Santa Clara, where we lived, to Santa Cruz, for a day at the beach. We always stopped at Togo's to get a sandwich - and let me tell you, those sandwiches were good! Anyway, that particular day has stayed with me because I was very thin - like 105 pounds thin, having just spent several months dieting (down from a starting weight of 120 - oh, the teenage-angst-horror!). I was looking forward to a Togo's sandwich, having deprived myself from them (and a lot of other food) for quite a while. As I stood in line with my friends, looking at the menu board and trying to decide which delicious sandwich to get, Jon said "you aren't going to get anything, are you?" - and I'm sad to say that the 17-year-old pleaser that I was actually said no. I learned that day what real hunger was - I didn't have anything other than a couple of TaBs. We spent all day at the beach...can you imagine not eating anything? Welcome to my life back then. When Diet Coke was invented, it seemed like manna from heaven compared to TaB! So I didn't get the sandwich. I decided that I should lose a couple more pounds, for insurance, so that when I did finally eat something like a Togo's sandwich, it would be ok. But it never was, and sadly I spent the first half of my senior year of high school barely eating anything, but getting approval from my all-important boyfriend for being so good about not eating - oh, and for being thin. By the time I finally broke up with him, I weighed 82 pounds. And I don't think my eating was ever normal after that...until recently. Now, I eat good, clean foods most of the time. I watch my calories, I workout - basically, I do what it takes to maintain a healthy weight (although I wouldn't mind losing ten more pounds, I'm obviously not trying all that hard). When I know there is an "eating occasion" coming up, I plan for it. I knew that the particular event last Monday evening would have cheesecake and pies from a local pie shop and that I might want a piece, so I ate a bit less during the day in anticipation. Once there, however, there were only banana cream pies, which I can pass on, and all sorts of cheesecake - chocolate, strawberry, etc. - but nothing stood out as something that I had to have, so I didn't pick up a dessert. Well, one of my friends noticed that I only had a cup of coffee and said "Oh that's right - you can't eat that" - indicating the pie on his plate. And then a few minutes later, another friend did the same thing! Now, it must be noted that these two men are older, and both did express shock at how I looked (it's been a few months since I've seen one, and close to a year since the other, who didn't recognize me at first). And I didn't respond - what was the point, really? But what I wanted to say was YES I CAN EAT THAT. I think that the next time this happens, and I'm sure that it will, I won't be giving anyone the benefit of the doubt ("they don't mean anything by that"), or, in this instance, the combination of an old person's pass AND my being stunned that someone would be insensitive. I will firmly, politely and, me being me, nicely, smile and say "sure I can" and enjoy my food, dammit. oh lordy do I relate to this. I used to get a lot of OH RIGHT YOU WONT EAT THAT and Id slide into a rant about how actually it was that I didnt like that(say lemon cake :)) and if I did I have some and move on because there were ZERO "I cant haves" in my life yada yada yada all while husband was standing there and slowing dying of embarrassment. What an amazing post this is. I'm 55 years old and was an anorexic my Senior year in high school. Oh, the memories this brought back. Thanks for the reminder that we need to stand up for ourselves. I also have always tried to give people the "benefit of the doubt"....or "consider the source"...but I'm old enough now to realize that some people are just plain mean!!! Congrats on your weight loss...but most importantly on getting healthy!!! Becareful of both diet coke and TAB...filled with Aspartame which lead me to MS symptoms. Lordy, was that Tab vile, vile stuff. I can almost still taste it. One of my earliest diets was joining my Mother in drinking Sego, I think that's the name of it. I believe I was nine. Disordered? You betcha. That was some vile stuff, too. I'm slowly moving into a headspace where I adjust for those things that are worth it, and enjoy them with no guilt. Long, long time coming. Its sad really how hard we were on our younger skinnier selves. I was 125 pounds in junior high and the beginning of high school and I thought that was fat how sad...I'll never be that weight again and I don't want to be either. Its funny what memories come back reading blogs. Ah, Tab. Throw in a pack of Virginia Slim Menthol Light 100s and you've got my "diet secrets" from high school. Ugh. Great post. You've probably spoken for 90 percent of women out there. My other "favorite" phrase is, "What CAN you eat?" I've learned to say, "I CAN eat anything. I just don't choose to eat everything." People (other than your jackwadboyfriend) don't mean harm in what they say to us about food, I'm pretty sure, but man, after years of our own psychological abuses, it can feel like a real judgement. 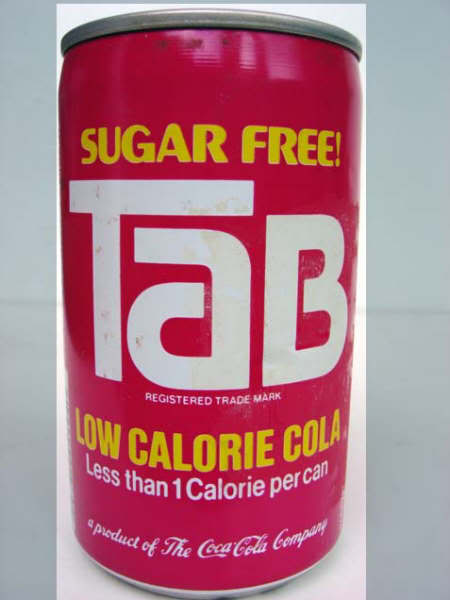 Tab was my first diet drink. I begged my mom to buy it. I think Fresca was the second. I still have a Fresca occasionally! Adolescent girls can be so silly. I've spent a lifetime battling the demon thoughts put into my head by old boyfriends. And, I worked very hard to make sure my beautiful girl didn't suffer the same. Now, at 50, my attitude is terrible. Any man who has a comment about my weight can kiss my curvy white behind. And for those folks who feel it necessary to remark on what I do or do not eat? I just smile and very quietly say, "Oh no. I eat whatever I want. I'm CHOOSING not to have that." I agree with Lynn, I love when they say sarcastically, "what CAN you eat". I feel like saying sarcastically back, "not the crap that you are serving!". But I don't, I just smile. It's so annoying that people make such assumptions. It's either "should you eat that" "Can you eat that" "You can't have that". Can you win?? I certainly would have said something, but that's me. If enough people say something to me, it usually comes out snarky like "Why is what is or is not on my plate of concern to you?". Or "I already had 3 big slices and I'm full, thank you". You are nicer than I am LOL! 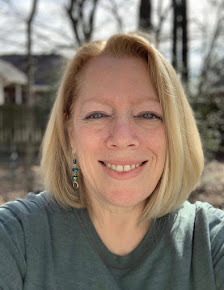 Shelley- Your blog caught my eye when I was browsing, since I have been writing about my weight struggles as well. But today's post had me laughing! I grew up in San Jose, and made the trip "over the hill" more often than we should have! We would cut school and go to Togo's there on that little corner in Santa Cruz, and then head down to the beach. Oh, the memories! Back then, I didn't worry about the weight, although I was probably 160 at the time. Turkey and Avocado... Mmm. :-) These days, I'd share one with you. They're just too big to eat alone! And why would anyone presume to even comment on that? THat's what I don't get. How rude. Interesting that you could easily pass on the desserts too. If I am going to splurge on one like that now, it had BETTER be worth it. I'm not going to eat banana cream or cheesecake (don't like) or something else so so, like an inferior browniejust to be polite! [I love brownies, but it has to be a quality one, not dry, ya know!] It needs to be a must have, like you say. I guess they were saying that by way of explaining to themselves why you had coffee only. A light, smiley response like, "Sure I can, just chose not to" might work, but-you owe no explanation, either. Silence is ok too. 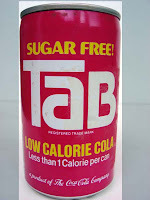 My mother lived on TAB too. I can remember them. They tasted alright to me at the time. Of course, what else was there. WATER?? Oh yea. I am realizing that allowing yourself to eat what you what, but not as much as you want, gives me so much freedom. Gah, people are so annoying. Side note on the TAB thing - my mom was ADDICTED to that stuff when I was growing up - she'd plow through a couple 12 packs a week! I am constantly amazed by what a healthy relationship you have with food! I still struggle daily and I hope to get to where you are at some point! My mom had the Fresca and Ayds candies back in the day. Yuck. Boy, this post hit a nerve with me. Back when I was 150ish, I'd have people come up to me at work and say stupid crap like that to me too. I felt unworthy of being able to eat and felt like they must've thought I was a fat cow. I thought I was. Although no one's said anything like that to me in years, I still sometimes hear those voices in my head when I'm eating at work. Great post! It's so scary what teenagers (and even some adults) do for the acceptance of others. It's good that you have learned to be a healthy eater. First of all, I think we are on the same page today. I went to Santa Cruz yesterday and wrote about it the commute from Santa Clara. Secondly, I totally remember that Togo's. It is a Mexican food restaurant now. 82 lbs! That is what my friends 8 year old niece weighs and she is tall and thin. Crazy some of the things we did as teens. Glad those years are far behind me. This made me kind of sad to read. The things we do for love, don't we. He almost got you anorexic (think I spelled that wrong) but I can understand why it happened. We always want to please others. And next time damnit: you take that pie! You've earned it, you deserve it and you will enjoy it! Wow, Shelley. 82 pounds. Yikes, I guess I'm glad I didn't have a boyfriend in high school. Yes, I like it when I plan for a special treat. I still don't like it so much when I just eat stuff 'cause its there.' Good post. I too was a teenage idiot,in terms of boy-pleasing. I teach teenage girls now and I think that some of them do have much better attitudes: they really do love themselves, in a good way, and don't take that much notice of what the boys say. But of course there are some who I see fading away week by week, thinking they're looking better and better - and setting themselves up for a lifetime of disordered relationships with food. Hard to watch. The fact that one adult would tell another adult what they can't eat is disturbing to me. THAT was very intense. I want to ring that old boyfriend's throat! I am really amazed by your very consistent eating habits. I am truly inspired. What a fabulous post. Isn't it kookie how an event can take you way back in time in the blink of a word, a thoughtless, annoying word. Quick question, have you tried Tab recently? I had one a couple years ago and they redid the recipe. It's actually pretty damn tasty now! Anyway, thanks for the Sister Powah moment. Feelin empowered and ready to fight another day! Thanks! Wow, what a story! (About the 82 pounds). I was anorexic too but never got below 107 or so (at 5'8"). I was younger and it was a bit of a control thing with my folks, plus that late-70s super-thin thing. I'm so glad you lost the bozo. 82 pounds is flirting with disaster. Down to 82 pounds! That's something! You must have been absolutely starving and twig-thin. So much better for you now, with everything that you know and do to be healthy. You are very inspiring. I have one guy 'friend' who sometimes comments on my curves..my last response to him was "it's none of your concern since you're never going to see me naked" ..lol. 82lbs was too too small- do not ever let someone influence you like that again. Hopefully your stronger now. I've kicked guys to the curb for saying things about my weight or critiquing me in any way. They say I'm too sensitive, I tell them they lack a sensitivity button and Bye-bye. When I read this post it almost mirrored every other eating disordered person I've ever known. Some of the food blogs I read on a regular basis (including yours!) are trying to enjoy food, not being so strict and having a good relationship with food. One of the girls blogs I read said it was only one sentence from a mere acquaintance that pushed her into ED. She had a sister that was a bit chubby, Sophia never thought about food other than to enjoy it. This acquaintance said "your lucky you aren't fat like your sister." She said she only ever saw this guy once more in the next six years, but something switched in her brain and she did whatever she could do not to get fat. It's all so sad, but I love that you now will eat that cake if you want it! You've come such a long way Shelley - so proud of you! TAB, now there's something I haven't thought about in years! I really appreciated hearing about your story as a teen. The teenage years are so hard, why do we put ourselves through so much? Your friends just sound ignorant. You be sure to set them straight next time! I think it is good for others to know that if they want to lose weight they don't have to deprive themselves of everything all the time! I am not a fan of the food police either. I really don't like it if anyone says to me, "should you be eating that?" AS IF they have some say! Enjoy your food! Tell them you are an adult, and your mommy doesn't forbid you from eating pies. Being that I follow basically a fat-free vegan diet for the most part, I hear that a lot as well. It's irritating. I'm always quick to reply that "I can eat anything I want -- I choose not to eat that, thanks." Usually it's because the people pointing out that I 'can't eat that' are doing it with a bit of a smirk, like I'm missing out on something good. I had a boyfriend once who told me that I was the most gorgeous girl ever, if only I had a body to go with it. However, like you, off came the weight. I think I ended up around 110 at that point. When he sees me now, he's all friendly and I want to junk punch him. 1) I read your blog in my reader, so I don't come to your actual site very often. So I just noticed - your page is great! I love the pink bike pics. 2) This was a wonderful post. I really appreciate you sharing both stories.